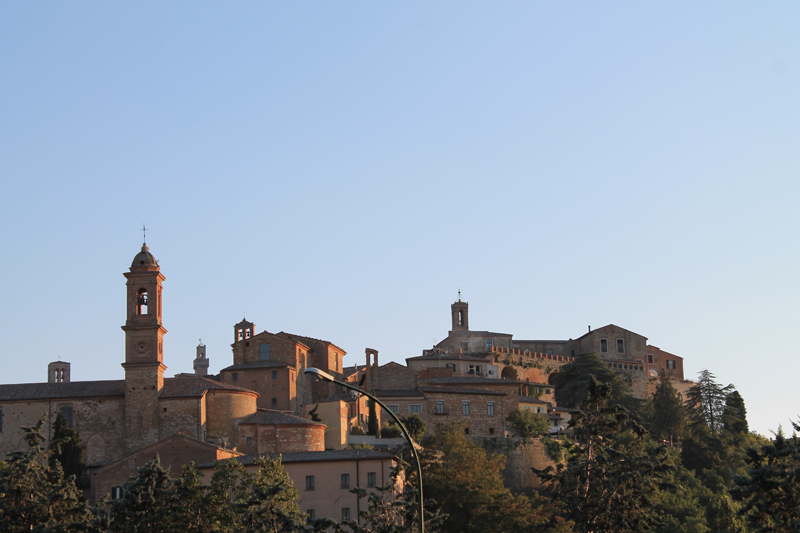 Our Tuscan stay-cation led us to Montepulciano (Siena) last week, a charming hill town in southern Tuscany that was important to both the Etruscans and the Romans. 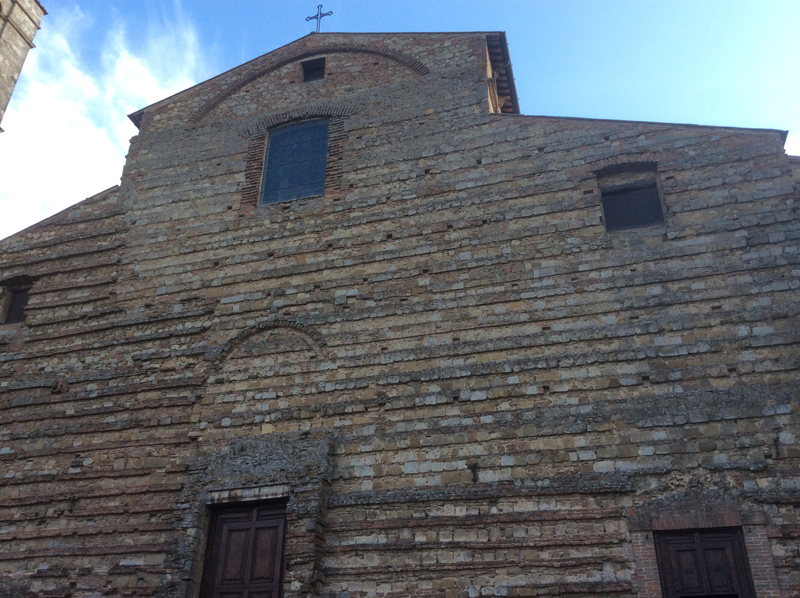 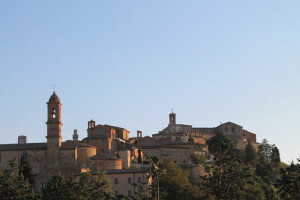 Like many Tuscan towns, Montepulciano sits on an Etruscan foundation. 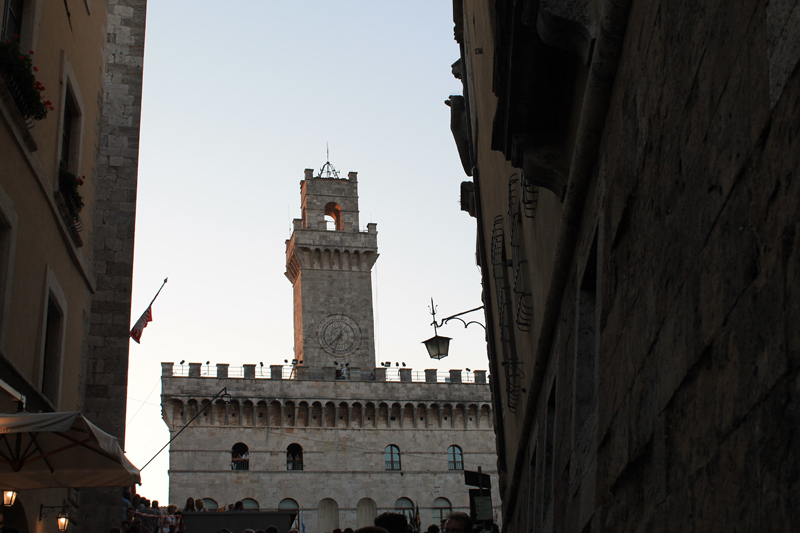 The town lived a period of splendour in the 15th century, when Florentine nobility built gorgeous ‘palazzi‘ as their summer residences. 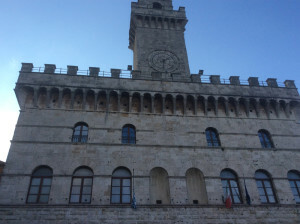 The Town Hall in Piazza Grande pretty much resembles the Palazzo Vecchio in Florence. 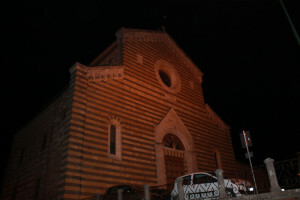 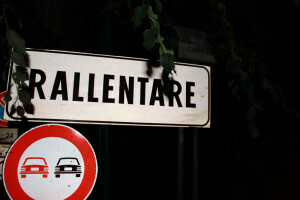 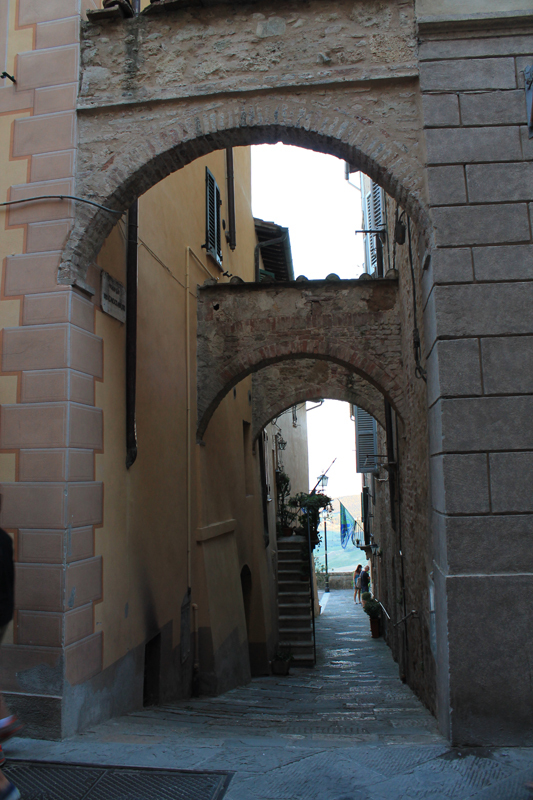 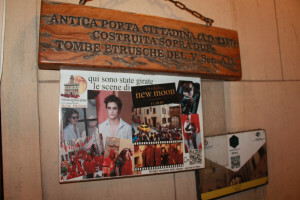 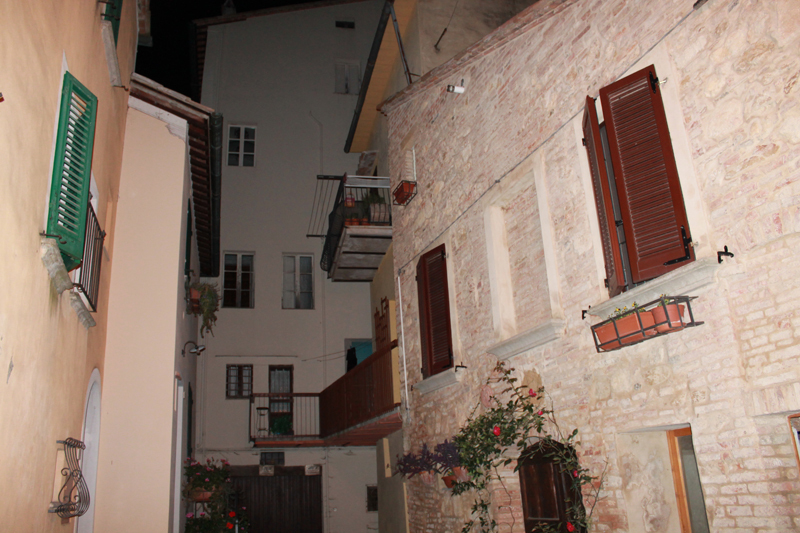 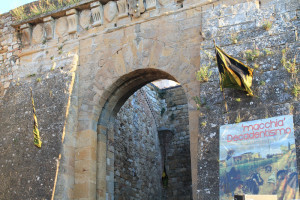 Recently, Montepulciano has attracted even more attention for its connection to the Twilight series of books and movies. Most of the second movie, New Moon, was filmed here. 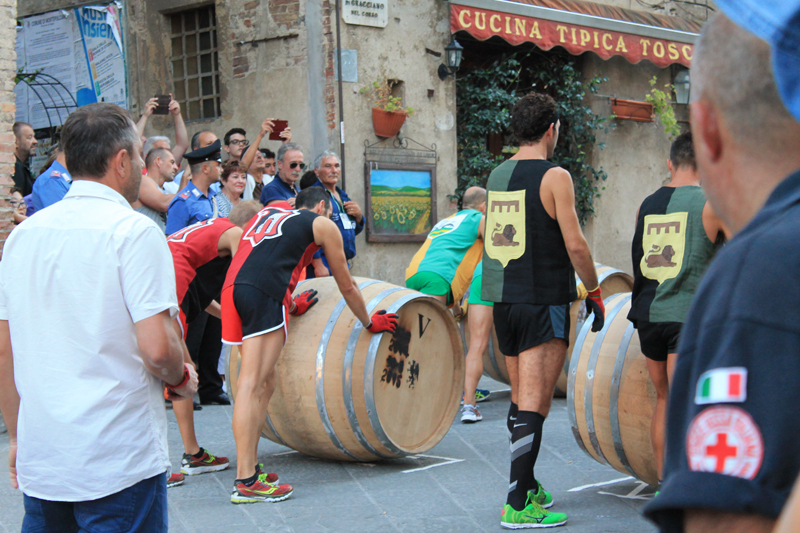 The Bravio delle Botti, a fun barrel-rolling event takes place in Montepulciano on the last Sunday of August and it’s among Italy’s most curious festivals. 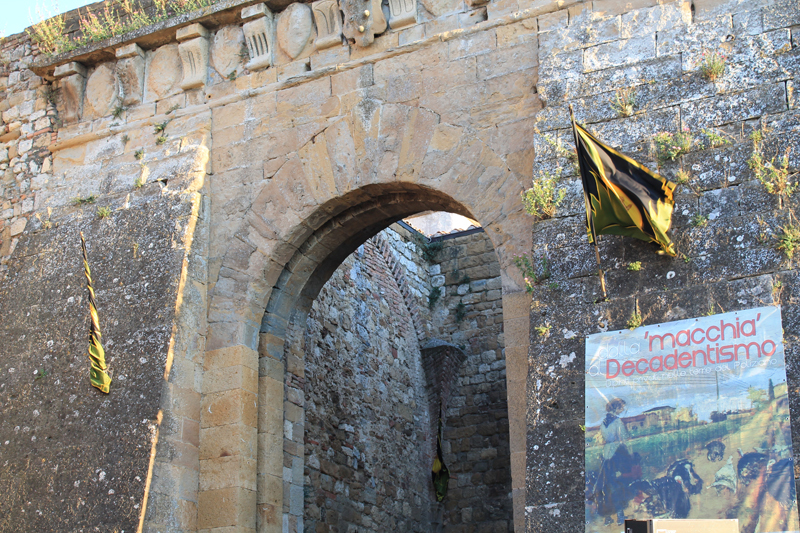 This must-see event is a historical celebration of a challenge between the eight contradas, who once used the horses to compete. The colours, the coats of arms and the same ceremonial routines have been maintained since the ancient times. 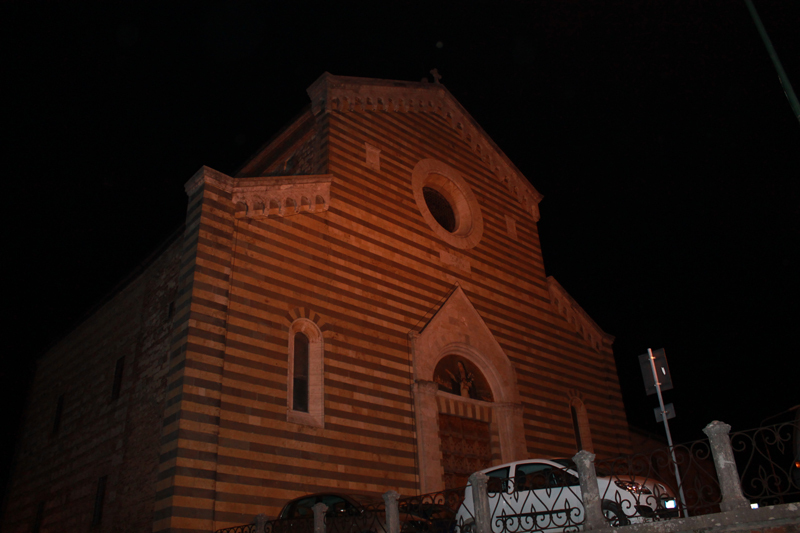 On Sunday morning in Piazza Grande the draw to determine the barrels’ starting positions takes place, followed by the offering of the votive candles to St. John in the Cathedral. In the afternoon 300 participants march in the historical parade. 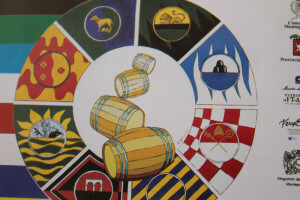 The barrel race begins at 7pm. The barrels, weighing 80 kg, are pushed and rolled between two athletes (called ‘pushers’), along the uphill route for about 1800 metres, winding around the picturesque streets of the historical centre, finally arriving at the top of the Cathedral steps in Piazza Grande. 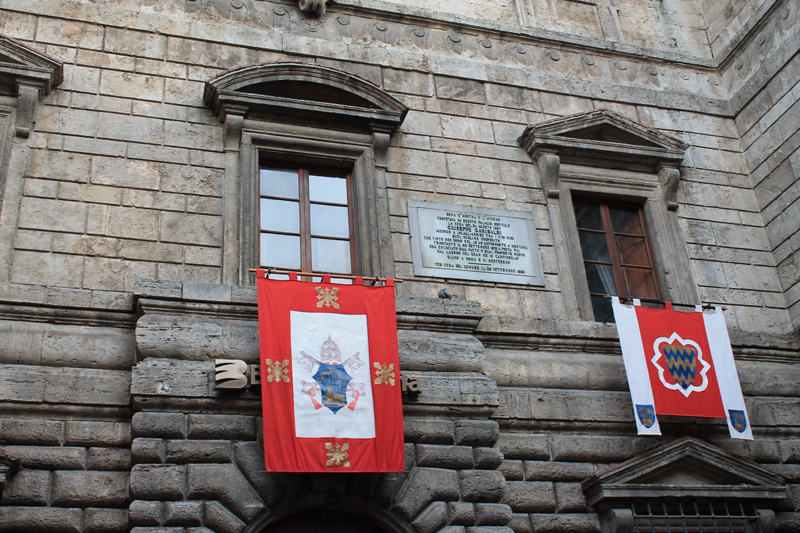 The winning contrada will be given the ‘bravium‘ (hence the name of the festival), a panel with an icon image of St. John, the city’s patron. 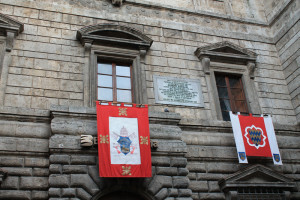 Winners 2015: POGGIOLO, colours white and blue, coat of arms three mounds. 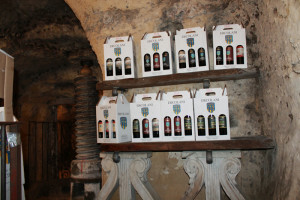 You’ll get passionate about the local wine. 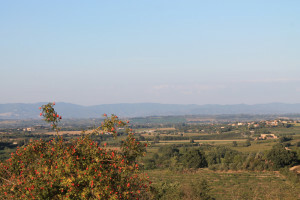 The region focuses greatly on terroir – the unique characteristics of the soil and climate, which give their wine a sense of place. 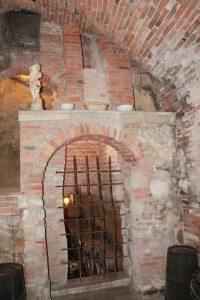 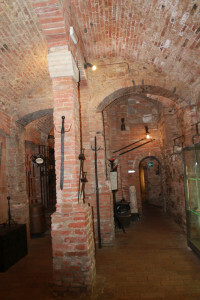 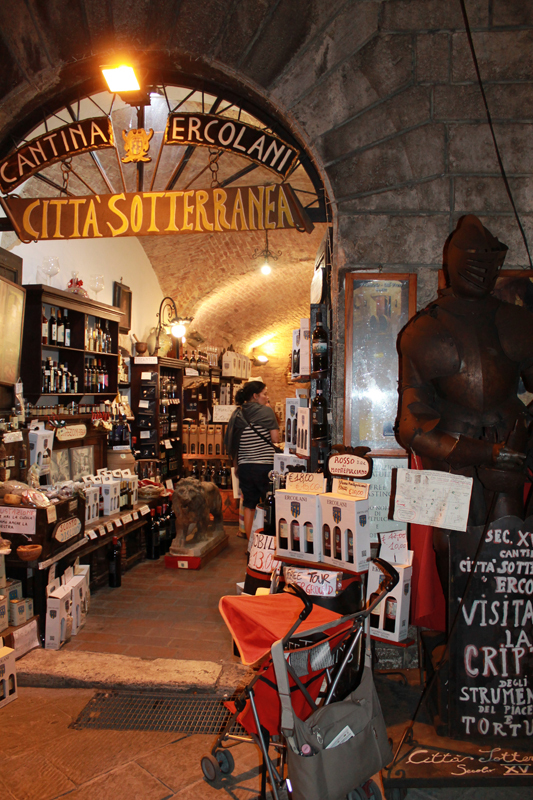 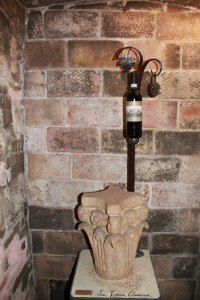 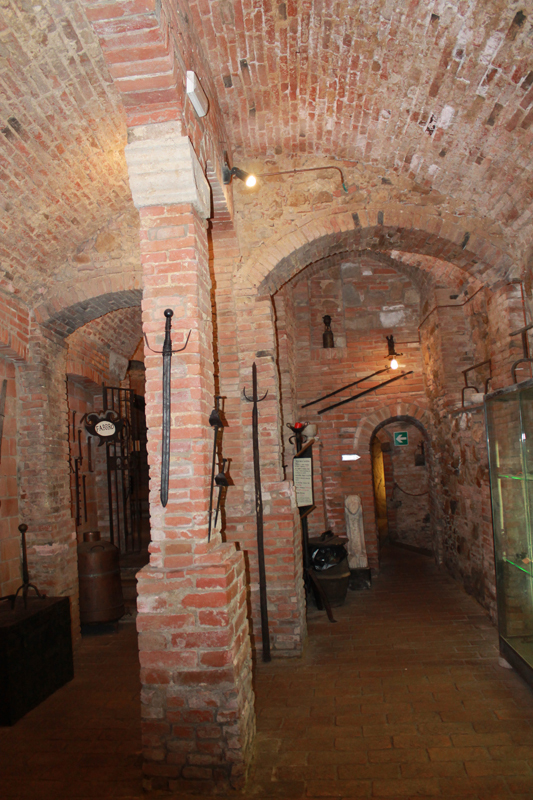 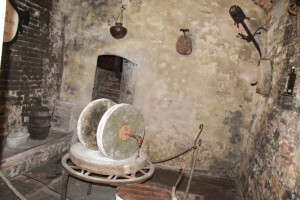 The Ercolani Winery in Via di Gracciano nel Corso welcomes visitors in the 14th-15th century Underground City with connection between seven historical buildings. 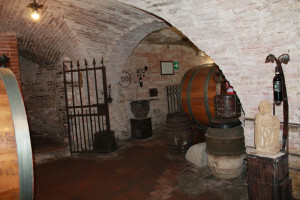 The cantina offers free tastings of wine and local products (cheese, salami, extra virgin oil) and free visits of the ageing cellar, the medieval museum and the Etruscan tombs. 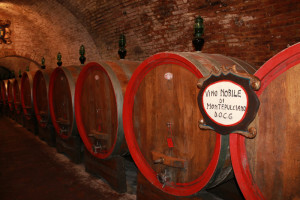 It is run by two brothers, Carlo and Marco, who have been agricultural entrepreneurs for 30 years and who maintain the tradition of the Nobile di Montepulciano using the four native grapes: Sangiovese (Prugnolo Gentile), Canaiolo Nero, Mammolo and Colorino, which are hand harvested at maturation in October. 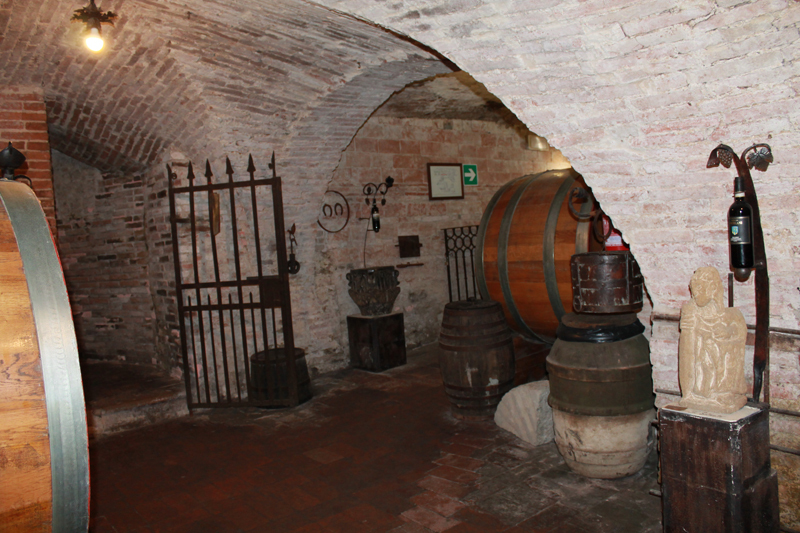 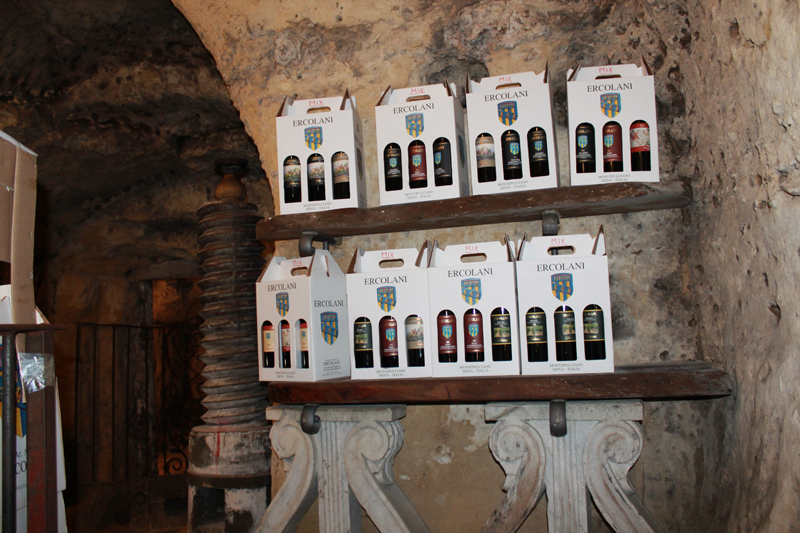 The wine is aged in oak barrels in the cellar of the underground city. 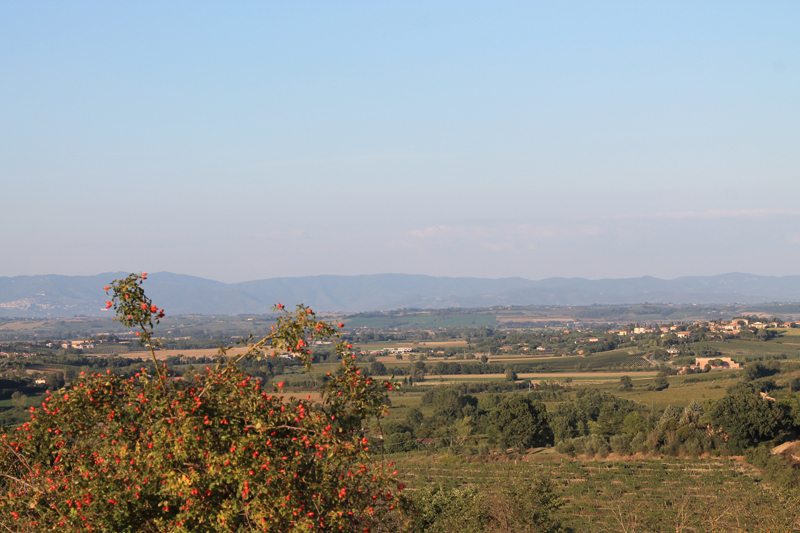 The Ercolani brothers’ winery, at the elevation of about 450 metres, is on 150 hectares of land, of which 14 are vineyards, 4 olive groves and the rest a combination of arable land, pasture and woods. Tuscan hill towns are best enjoyed by adapting to the pace of the countryside.